During my growing up years in Canada, I was acquainted with the leek while watching my mother make vichyssoise for her dinner parties: a thick soup of puréed leeks, onions, potatoes, cream and chicken stock, traditionally served cold. 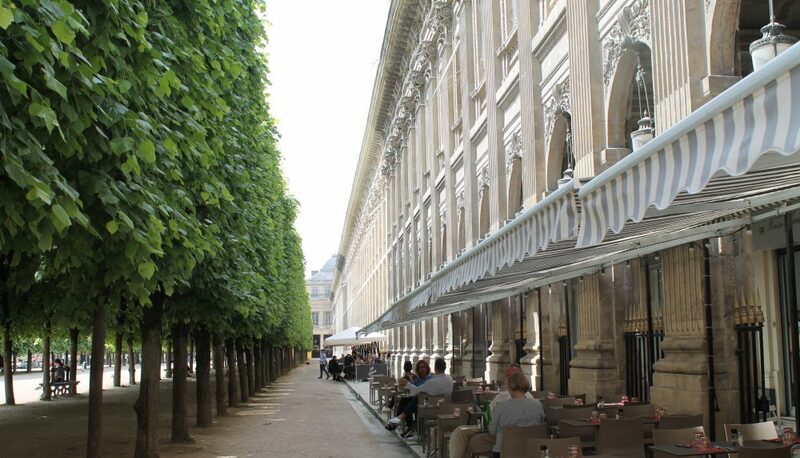 But the French don’t make vichyssoise, even though it’s named after the French town of Vichy. Or rather, they do make it, but under a different name: velouté de poireaux et pommes de terre. Velouté means velvety. The origin of the name vichyssoise, apparently, is the Ritz-Carlton hotel in New York City. Here’s my recipe. 1. Place a heavy-based sauté pan over medium heat and add any kind of oil. Nut oils are nice if you have (walnut, hazelnut, etc.) When hot, add the leeks, cut into rounds, and cook, turning frequently, until they’re softened and a golden color. Season with salt and pepper. 2. Add garlic, thyme and butter. Once the butter has melted, add some white wine (not too much) or if you wish, a small amount of chicken broth (optional). 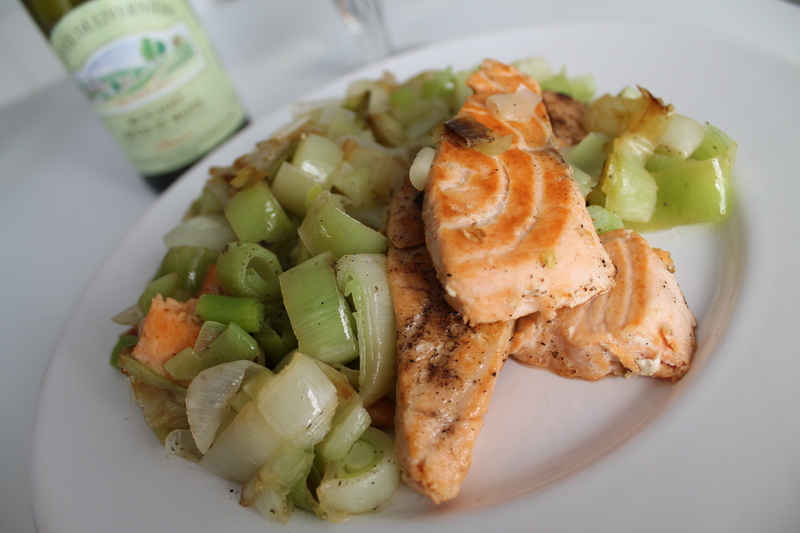 Set a piece of fish atop the leeks, cover the pan and simmer gently for 12–15 minutes. If there’s a lot of liquid, remove the lid for the last 5 minutes of cooking time in order to reduce it. 3. Transfer to a serving dish and sprinkle with parsley if you have any lying around. And voilà. There’s your steamed fish with veg in a single pan. Simple. Serve with a Muscadet or a light Alsation wine. Yesterday, while food shopping after work, I bought a big bunch of fresh and fragrant rosemary for under two euros. If you don’t know what to do with fresh rosemary, you’ll find a ton of ideas on the internet. But here’s one idea you won’t find: heat the electric burner of your stove to high. When it’s really hot, throw a handful of plucked rosemary leaves onto it. The scent is gorgeous. You can do the same with fresh sage or thyme. 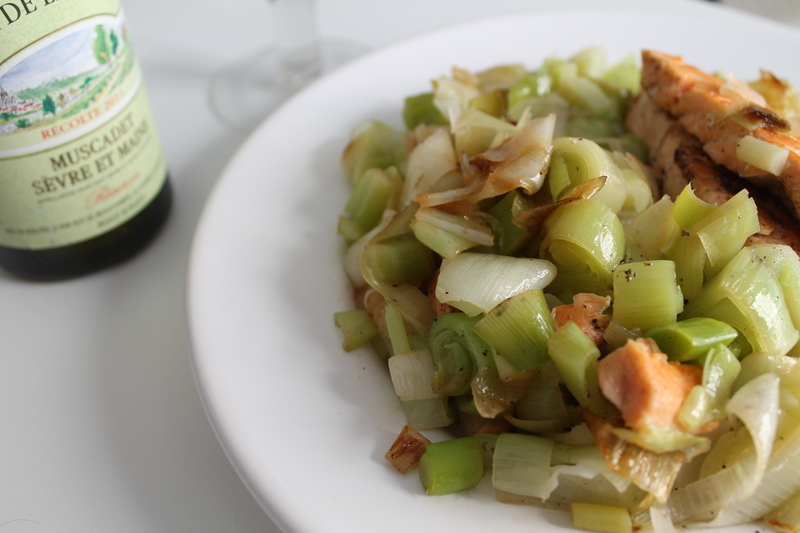 This entry was posted in FOOD, General and tagged leek recipes, leeks, vichyssoise by julesparis2013. Bookmark the permalink. Sounds fabulous! Thanks. I will be trying this for sure. I’m fresh out of leeks right now. Tonight, Saturday, is pizza night!